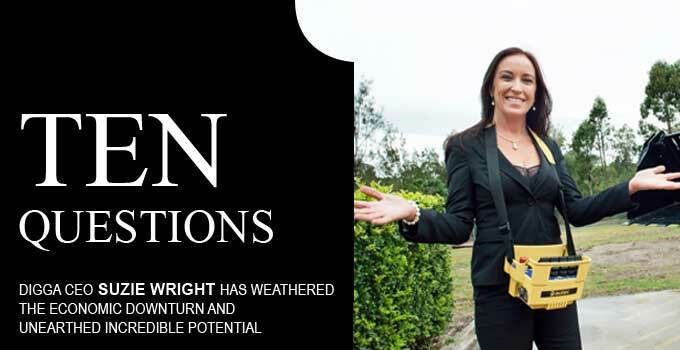 DIGGA CEO Suzie Wright has weathered the economic downturn and unearthed incredible potential. 1. Can you tell us a bit about what Digga does? Digga is Australia's No.1 manufacturer of attachments for earthmoving equipment and a developer of world-leading technology. The company employs 200 staff at Yatala its headquarters, with a 12,500sq m manufacturing plant. 2. How did you get your start in Digga? I started working with the company in 1997 in marketing and PR roles, before taking over as CEO in 2004. 3. You're expanding in to the US. Why now? We have developed world-leading technology in our field for large planetary drive units for screw anchor installation and augering (drilling) for excavators. We needed to mature our systems and global sourcing plans before we could take on the venture and this sector is a rapidly growing market. We recently acquired a site in Iowa for an assembly plant that will eventually employ 30 people. Our core market is eight to 45 tonne excavators and the US is the second-largest market, China being the largest. We are about to ship the first 500,000Nm (50 tonnes of rotational force) drive to Canada. 4. What has been your most difficult or challenging day in business? Installing a new enterprise resource planning system presented us with many challenges. There were times when we over-ordered stock by up to six months. We went through heartache implementing the computer system. It was equally as frustrating for our supply chain as we would under-order, then over-order. We have since appointed an ERP expert who undertook intensive 12-week training with management to teach us the fundamentals and who continues to mentor staff. 5. What do you consider your greatest business achievement? I oversaw the relocation of the whole business from six sheds at Staplyton to Yatala in 2006-07. It was a massive undertaking and I managed the construction of the new 12,500sq m building across eight acres (3.2ha). We have also completed two acquisitions Universal Augers and Kanga Loaders. The chief executive of Kanga approached us to buy the business and at the time I said no as we had strong cash flows and were about to invest in the US. For 20 years Kanga was our fourth-largest client and when they went into distress, we were the third-largest creditor. We would not have got a cent in the dollar from administrators, so it was purely a commercial decision to acquire them. It was a decision that also protected our future supply chain and other creditors. 6. What impact has the GFC had, and how have you dealt with it? We deal on the global market with exports a significant part of our business and we were in the US four months before the downturn. We saw the writing on the wall in 2008. There were stockyards full of equipment everywhere, machinery wasn't moving. It was like someone turned the tap off. Prior to that we had three tremendous years of solid growth and the staff had worked extremely hard. We made a decision to not lay any staff off, but to cut overtime. Everyone kept their jobs. 7. What's your take on the current manufacturing market? Manufacturers are under enormous strain and my honest opinion is that without fundamental long-term vision by the Federal Government and radical industrial changes, the industry will disappear. The high Aussie dollar and cheap imports are hurting manufacturers enough without having to contend with fundamentally flawed things like WorkCover. It's difficult to invest in something that doesn't work and is not professionally run. 8. How is Digga succeeding where other manufacturers are failing? We invest heavily in R&D and have a focus on innovation, engineering, product development and becoming a world-class assembler so that we can control quality and give our clients what they need. With our R&D engineers focused on new product development, some exciting new products for our core skid steer market will be launched in early January, 2013. We will also continue to capitalise on opportunities arising in the mining sector and our Kanga brand has been successful there with a new remote-controlled loader being used in mines in South America. 9. What are your favourite hobbies? Anything fast, like water skiing with the family. I enjoy nice wine in good company. 10. What is your favourite holiday destination? Banyan Tree Resort, Bintan Island.